Born in Jersey City he was a lifelong North Arlington Resident. He proudly served in the United States Navy diring the Vietnam War. 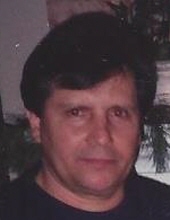 Joseph worked for 35 years as a truck driver for various companies in Port Newark and Elizabeth before retiring and was a member of the International Brotherhood of Teamsters Local 641 and 521. He is the Cherished lifelong companion of Carol DeLeo, the loving brother of Rose Esposito, Mildred Wendauer, Gloria Martin, Mary Esposito, Jean McFaulds and JoAnn Barttole He will be greatly missed by his many loving nieces, nephews, relatives and friends. The visitation will be held on Tuesday, March 19 from 4 to 8 P.M. at the Parow Funeral Home, 185 Ridge Road, North Arlington. Relatives and friends are also invited to meet in Queen of Peace Church, North Arlington on Wednesday, March 20, ay 9:45 A.M for the Funeral Mass followed by the interment in Holy Cross Cemetery, North Arlington. To send flowers or a remembrance gift to the family of Joseph M. Esposito, please visit our Tribute Store. "Email Address" would like to share the life celebration of Joseph M. Esposito. Click on the "link" to go to share a favorite memory or leave a condolence message for the family.